Aircraft history HB-ICV c/n 147 made its first flight on October 2nd and was delivered to Swissair AG 17 days later as “Schaffenhausen”. Accident description Flight SR306 was a scheduled flight from Zurich to Rome via Geneva. There was a deep fog at Zurich Kloten airport when HB-ICV was pulled out the hangar to be prepared for its flight to Rome. At 05:40 local time the crew began its preparation – the parking brake, which was set to 9 (the Caravelle has 9 different levels for the parking brake 9=full; 0=off) by the ground staff one hour before, was now set to 1 (stand by) by the cockpit crew. This means that the Caravelle could taxy as the brake discs hardly touch the wheels. However, in this case the brakes can overheat if the aircraft rolls too fast for a prolonged period of time. When the aircraft started taxying, the parking brake was still set to “1” . As the fog was so dense a “follow me” car had to guide the Caravelle to runway 34 as RVR (Runway Visual Range) was reported to be 180m which was below company limit (200m). The crew requested a taxi run down the runway to disperse the fog with hot exhaust gases. A common Swissair procedure at that time. The Caravelle taxied slowly at almost full power for 1400m to disperse the fog, then backtracked again again using high high power and brakes. This procedure required an immediate take off as the fog would quickly cover the runway again.When “Schaffenhausen” made a 180° degree turn at the end of the runway to commence its take off roll, N° 4 wheelflange split and its tire exploded. As there is no brake temperature gauge in the cockpit of the Caravelle the crew set takeoff thrust and began its take off run. At 06:13 the plane rotated with a burning left main gear. After the gear was retracted the fire quickly spread in the wheel bay. The Caravelle was now losing hydraulic fluid which was highly flammable. Due to the overheated brakes the fluid caught fire together with the tires. The plane was climbing to 10.000feet heading 300°. By now the fire had destroyed all hydraulic systems and the fuel line to engine number 1 which failed. 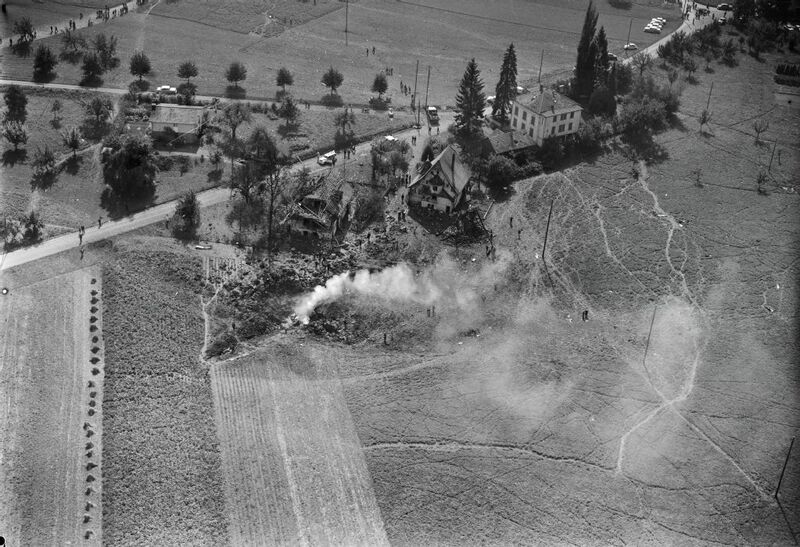 Due to the destroyed hydraulic system the plane was out of control and yawed to the left. “Mayday Mayday 306 no more….no more…” that was the last heard of Swissair Caravelle 3 “Schaffenhausen”. The plane exploded when it hit the ground. All 80 occupants died. After this accident the hydraulic fluids had to be nonflammable and the hydraulic system reinforced in the wheel wells. Swissair installed a fire warning system in the wheel wells on all Caravelles within 3 weeks after the accident. The effects of a tunneling manoeuvre to disperse the fog had never been analysed. A contributing factor was the highly flammable hydraulic fluid, not Skydrol. An additional safeguard adopted widely by Caravelle crews was to keep the landing gear extended as long as possible after departure to cool the brakes. A procedure even used today on modern airliners.